Toshiba has launched its tablet in India dubbed WT8-B. It had landed in store and is exclusively available with Amazon India. It will be running on Windows 8.1 with price tag of Rs 15,490. 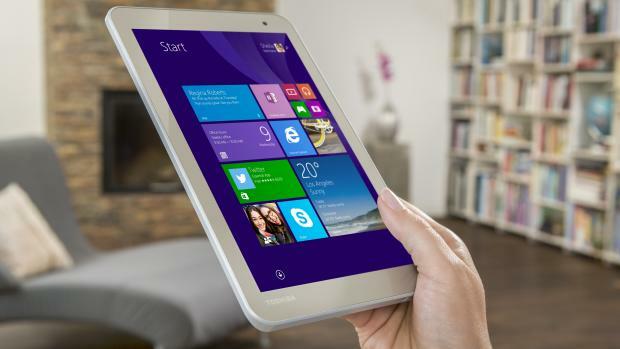 WT8-B has been introduced earlier in May globally with title Toshiba Encore 2 8-inch tablet. In India, company has entitled different name i.e. Toshiba WT8-B. It has been loaded with one year free subscription to Office 365 personal and comes with lots of preloaded apps like- Amazon, Xbox, Skype and the likes. Speaking of specifications, it will feature 8-inch WXGA multi-touch display with a pixel resolution of 1280 * 800 followed by 1.33-GHz Intel Atom Z3735G quad-core processor coupled with 1 GB of RAM. It packs 32 GB as internal storage which can be expanded upto 128 GB via. microSDXC card. Battery is of 3788 mAh which supports 11.1-hours of usage time. It is available in Satin Gold color variant only. Connectivity includes ultrafast Wi-Fi, Bluetooth, micro USB. It comes with 5 MP rear camera with auto focus while front camera is of 1.2 MP with fixed focus. The WT8-B does not have Sim slot and does not support calling features. Although, the tablet has good storage capacity. Camera is also quite good. The price quoted against the Tablet is quite high but the users who loves Windows can go with WT8-B.